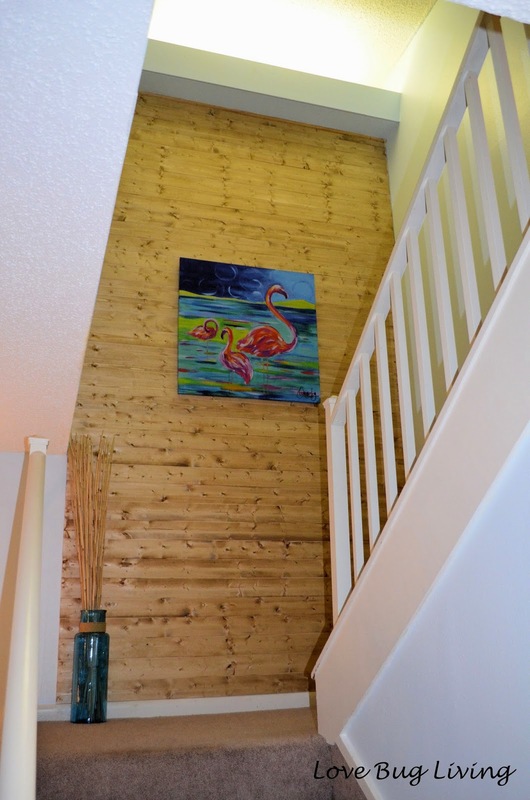 We knew we wanted to make a statement on the staircase in our new beach condo. A big impact, but still be simple and beachy. This Wood Plank Accent wall was just that. 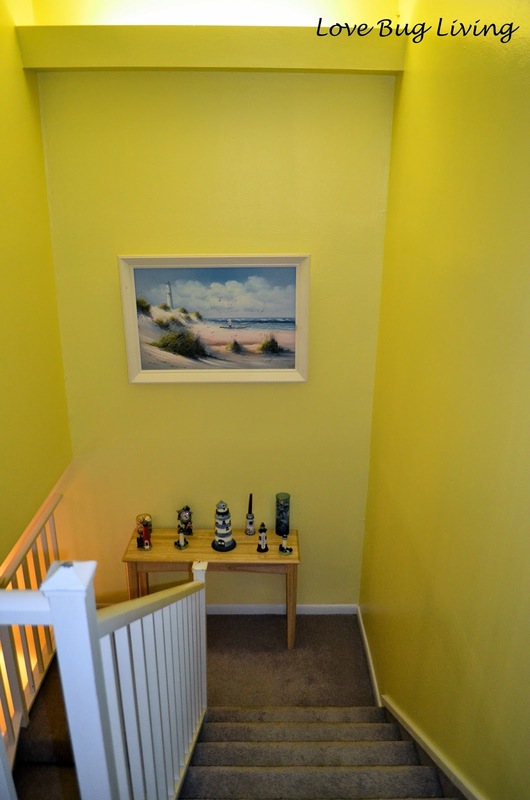 This was our Before staircase. Still don't like the yellow and the table with lighthouses seemed like an accident waiting to happen. Plus it was just cluttered looking. The first thing was to paint! 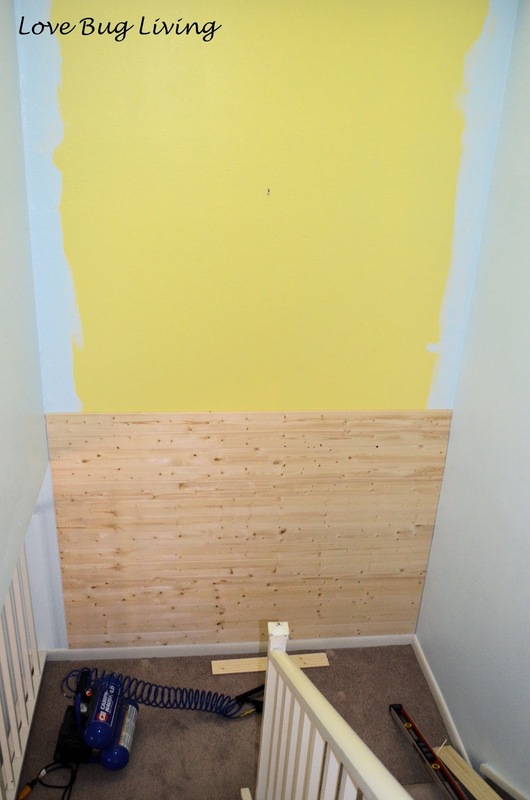 We didn't have to paint the whole back wall since we would be covering it up, but we did paint into the edges a bit to make sure no yellow showed through. I found this plank paneling at Lowe's. Each pack come with six pieces of 8 foot tongue and groove paneling. 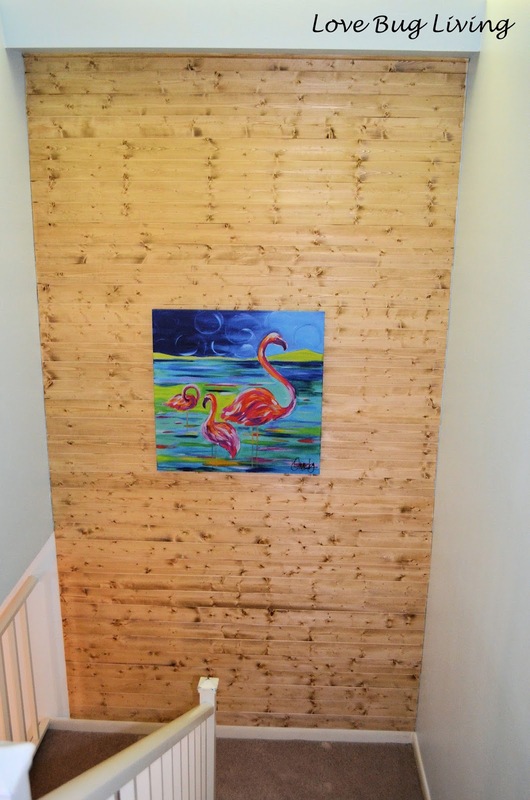 We were able to do our stairway wall and another smaller project for a little over $100. 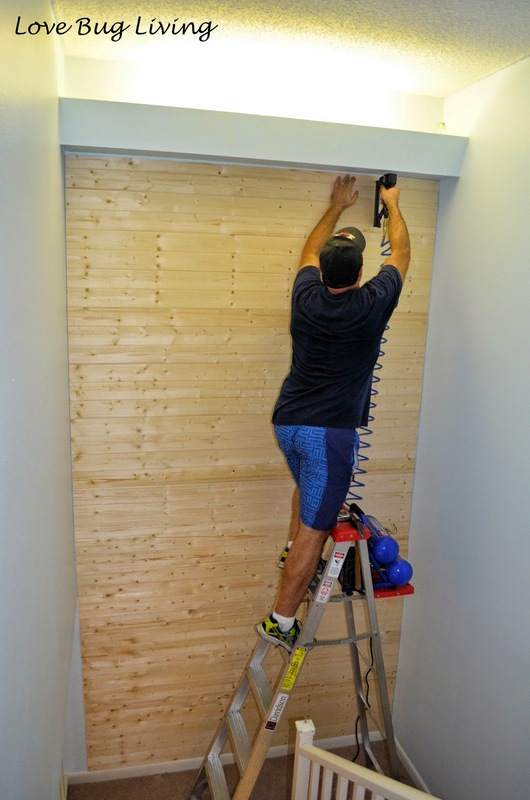 Starting at the bottom of the wall, we lined up our pieces with the base board and nailed in place. The pieces had to be trimmed in order to fit our six foot wide area. Stack your next panel in place with the grooves and nail in place. Continue up your wall. Once we got to the top of the wall, we were left with a small gap. It wasn't big enough to add another strip of paneling, so we found a piece of quarter round molding that we were able to nail in place as well. After all pieces were in place, we stained the wood with a medium/light stain. Do a smaller section at a time so that you can keep your color relatively even. 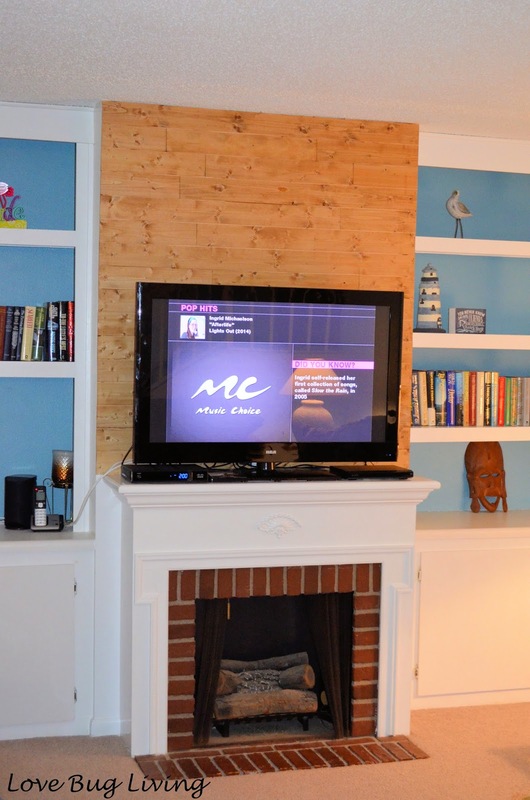 We also used this wood plank accent on the wall above our fireplace in our Family Room Makeover. I love how the two projects tie together. 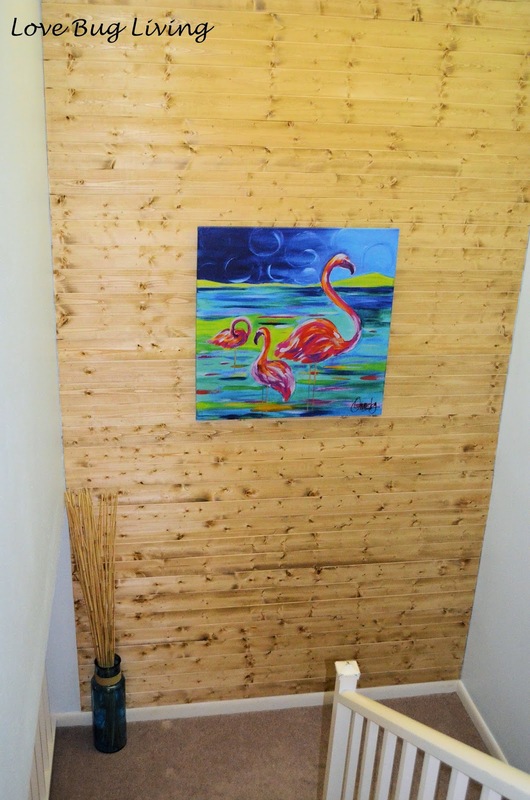 After the stain was dry, we hung our flamingo canvas and added a large vase. A simple and inexpensive project that we completed in about half a day. I really think it makes a big impact for the money we spent. Love how it turned out! Yes it does create a big impact! I love the texture of your wall. Nice job!